Apple’s Lightning cable already makes life easier for iPhone owners since it plugs into an iPhone or iPad no matter which side is facing up, but the iPhone 6 USB cable could make plugging in even quicker for Apple fans. 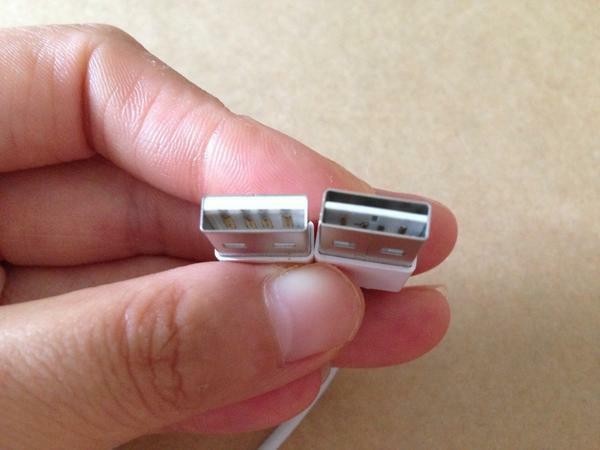 A new leak from Sonny Dickson, who has a pretty solid track record when it comes to revealing Apple’s plans, shows a new reversible USB cable that could come with the iPhone 6 and other new devices later this year. Apple actually patented the design for a reversible cable that would work with standard USB ports earlier this summer, 9to5Mac recently noticed. Now we have an idea of what the new plug could actually look like thanks to Dickson. It looks like Cupertino’s slimmed the center tab and added a set of connectors on both sides so it works the first time you plug in. The entire industry is already headed towards reversible USB ports, but Apple could be a few steps ahead of everyone else. A new Type-C spec is set to roll out for microUSB later this year, but probably won’t become the standard for most devices for at least a another year. By comparison, Apple could rollout its new USB design this fall and quickly corner the market, giving Android fans another potential reason to try out the iPhone 6.